Merelita is an 11 year old girl. Merelita lives with her mother who is an unemployed single parent. Her mother earns a small amount of cash by selling vegetables at the market. 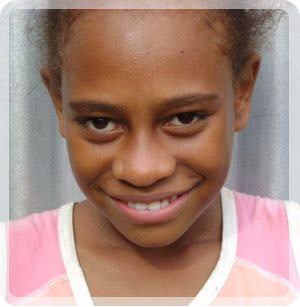 Merelita enjoys attending school and her favourite school subject is English. Merelita travels to school each day by carrier van. When she grows up, Merelita wants to be a nurse. Merelita is cared for only by her mother who is unemployed. She is grateful for your finanical assistance so Merelita can continue school.